Money is a clear reason for people to go to work. They have to earn a living. Money provides the carrot for climbing the corporate ladder but, as long as you pay people what they’re worth, financial rewards alone do not always satisfy and motivate people. Take a Premiership football player, for example. They’re paid fantasy money compared to most of us, but so many fail to deliver. They’re probably not feeling very motivated when they’re sat on the substitute bench week after week. Motivation is an internal process that drives the needs, desires and wants of an individual. But, whilst it’s easy to feel motivated about something, like the idea of going for a run, it’s much easier to actually do it when it’s easy and doesn’t make us feel too uncomfortable. That’s why people generally want to work for an organisation where there is direction and great leadership. Great leaders learn how to motivate their people on an individual basis instead of falsely assuming they’ll all work harder for an extra financial incentive. 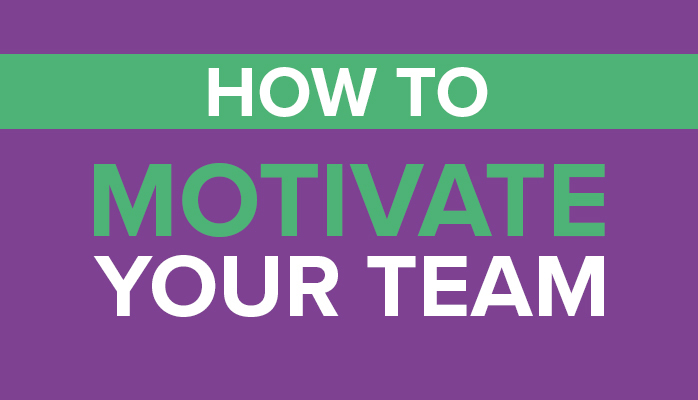 There’s lots of advice about how to motivate staff, but when you boil it down, it’s really about building a strong performance system. A system which enables your staff to understand what they need to do, and feel comfortable that they can do it, with just the right amount of stretch to keep things interesting. Is the employee clear on the organisational vision and core behavioural values? Defining, articulating and communicating the company’s vision helps align all employees on the same journey. But inspiring everyone to follow can be a challenge! You need a simple, relevant and believable vision of the way ahead. This is particularly important during times of change. On an individual level, does your employee understand what is required from their role and why? Do they know the desired output? Do they have a good example of what this looks like? A clearly defined performance requirement is the first step towards filling any existing performance gaps. Once an employee is clear on what is required of them, they need to feel confident that they can do the work. If they’re not, you need to ensure they have access to the education and training they need to develop the required skills. Challenging tasks can be great for motivation, but only if they are attainable. Offering opportunities for growth and personal development gives employees a sense of empowerment. Giving staff the tools to find their own way to solve problems fosters a culture of innovation. Give them the appropriate skills, then invite their input and suggestions, ask questions, listen to their answers and implement their solutions. This can be very powerful for any organisation. It’s important to have clearly defined goals. Goal-setting is linked to task performance and is the main source of intrinsic motivation – motivation driven by an interest in the task. Setting clear, specific and realistic goals with clear priorities leads to great outputs and better performance. Your team should receive timely, relevant, specific and constructive feedback on their performance against the measures you have agreed.Listening and completing feedback surveys, for example, will help your continual improvement journey. Success should be recognised and shared. Even a simple thank you can make staff feel valued. Celebrate success, show appreciation, and make sure any incentives are meaningful from your team’s perspective. It’s proven that perks, no matter how small, help engage and retain employees. In any business, your people are your most important asset. Disengaged staff can have a significantly negative effect on productivity, customer service levels and retention. Creating and maintaining a spirit of enthusiasm can lead to very real performance improvements which positively affect your bottom line. Change can introduce uncertainty. But following the above steps will help move your team through that process successfully. When you combine the energy, knowledge and skills of a motivated group of people, great things can happen. My work often focusses on organisation culture. I have developed high performing teams that have enjoyed scooping various awards. So I know this simple approach works. To continue to get desired performance, you have to feed it. Whatever route you choose to do so, it must matter to your people and be aligned with your desired performance. Wellbeing can often be closely linked to motivation. I’ve always been fairly self-motivated. But I wanted to make some improvements in my own life, so I set myself a little challenge: to cycle 1,000 miles during the summer (I managed 763 last year). I know feeling healthier and fitter makes me happier. I know the resulting flatter tummy makes my wife happier! I find that breaking my goal down into daily or weekly chunks helps me stay on target for success. By making each goal achievable, I’m feeling very motivated at the moment and have already clocked up 442 miles (we all have to start somewhere). My reward is that I’m already feeling better in myself – and I get some much-needed thinking time on my bike!